I always enjoy having cranberries with my holiday meal and usually make a variation of my mom’s recipe, which you can view here. This year, I decided to try out a new recipe for cider spiced cranberries using whole cider spices, fresh apple and dried currants. It made the house smell warm and cozy, and as a result, all I wanted to do was cuddle up on the sofa with a blanket and Christmas movie! Anyway, the cranberries turned out perfectly and just how I envisioned — tart, a little sweet, warm-spiced and chunky. Eat them hot, cold, on turkey, mixed into yogurt or even on their own, these cranberries are delightful and become even more flavorful after chilling. I hope this recipe makes an appearance on your holiday table. Combine orange juice and cider spices in a medium saucepan and bring to a simmer over medium-low heat. Simmer for 15-20 minutes. Then, strain mixture and return the juice reduction back to the pan over medium heat. Add the water, raw honey and ground cinnamon, and stir until dissolved. Then, add the cranberries, dried currants and chopped apple. Stir and bring to a simmer. Cook fruit mixture for about 7 minutes or until most of the cranberries have popped. Once done, remove from heat to cool and stir in the butter and chopped pecans, if using. Chill in the refrigerator for a few hours or overnight, before serving. This is fantastic! 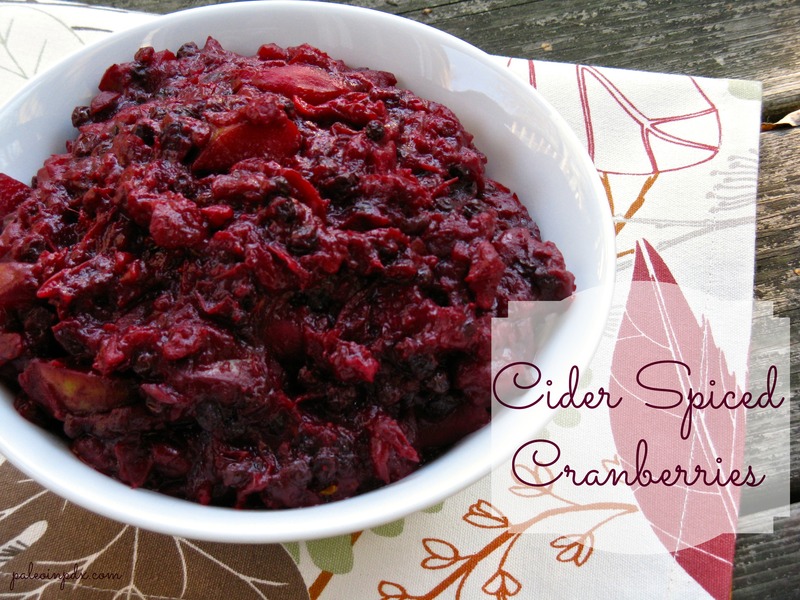 One of the items I’m bringing is a cranberry dish & I was going to do the plain old cranberry sauce from a can. Yes, I said from a can. Now I have something much better!! From a can, Heather?! That’s nonsense! Yes, you must makes these — super easy. I got my bulk cider spices from Food Front, in case you’re wondering. The timing of this is perfect because my hubby and I will be having our own little intimate Thanksgiving dinner and I want a good cranberry sauce to go with the venison steaks we’ll be grilling (he just got his first deer a few weeks ago). I love the looks of this recipe….and of course there will be squash pie too!! Your little Thanksgiving sounds wonderful and congrats to your husband on getting his first deer! I’m glad my recipe came through just in time. Venison is SO good, but I only really get to eat it when I go back to Michigan. My dad is a deer hunter and usually always has some in the freezer. Last Sunday, he shot an 11-point buck. Talk about huge! Have a lovely dinner! Made this to go with our venison–it’s fabulous!! I divided up the batch and used a small apple in half and a persimmons in the other half. Both were really good with the OJ and spices and I love the nuts in it for texture. I am really liking the venison and feel good about being able to have meat from an animal that lived and ate in its natural environment. Your dad’s deer–yowza–huge indeed and that ought to keep the freezer stocked for a while! Thanks, Paula! Great idea with the persimmons — that sounds lovely. Truthfully, I forget about persimmons…probably because I rarely eat them and didn’t grow up eating them (nor did I even know what they were). Venison is really good, especially when it’s the fruits of your labor (or in this case, your husband’s). I wish I could get my hands on some of my dad’s, but I’d have to go back home for that!